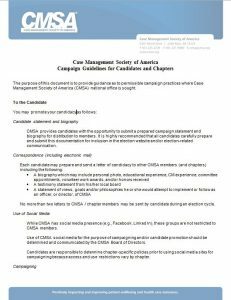 CMSA is a not-for-profit Section 501(c)(6) professional society that is governed by an elected Board of Directors, supported by appointed Task Forces, and staffed by a professional association management company. In keeping with its mission "to promote the individual and collective professional development of health care case managers", future leaders will join a team of visionary leaders and dedicated professionals who are setting the pace with case management practice and health policy in today's healthcare environment. Future leaders possess the necessary competencies and professional literacies as well as the commitment and dedication to drive visionary thinking. If the expectations duty described in the Position Descriptions match your desire to lead and you meet the requirements of the office, we encourage you to take the next step towards national leadership. This document provides an overview of the basic requirements of each of the board position which include terms of office, functions, competencies, responsibilities, and time commitments. Complete this Call for Nominations Form and email to randall@fraserimagineers.com along with CV, Letter of Recommendation and other requested information.